Headlines: It was a return to winter over the weekend with high winds, rain and a heap of snow up high. While this made the fishing difficult, the water around for the streams and lakes will only help the fishing over the coming weeks. The fishing over the long weekend is set to be fantastic with rising water in the lakes and plenty of good rainbows in the streams. Don't forget to pop in and have a free tea or coffee on you way to the water. Lake Eucumbene continues to rise and is now at 28% plus! The ground being covered has not seen water for three years and there is plenty of food coming out of it which is attracting the fish in to the margins. Bait and fly anglers should do very well this week. And this is sort of quality fish have already been caught in the past week. Super fat, super energetic, pocket rocket rainbows. A blast to catch and great on the table too. Rivers:- Reopen this Saturday the 3rd of October. With some good snowfalls in the area the mountain rivers will be flowing well for the opening. 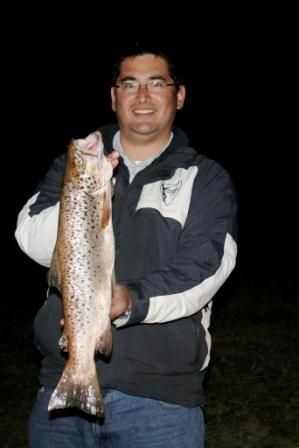 The Eucumbene and Thredbo have good numbers of rainbows and should fish well. Glo bugs and beadhead nymphs will be the optimum patterns for the Euc and Thredbo rivers. Use plenty of weight to get the fly down as this is the most important part of the spawn run fishing equation. A dead drift is also key to success. 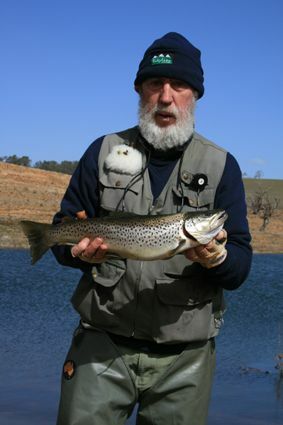 *Above Brian Julian spent a few days in the Old Adaminaby area and managd a couple of nice fish including this near 2kg brown. He said the lake looks fantastic and will be returning to catch some more soon. *Danny Spelic and Mark Bulley fished Frying Pan recently landing eight fish that on fly between them in a couple of hours. As they left, the fish started rising! According to Danny that part of the lake is looking a million bucks with midge already buzzing around and plenty of other food items around the edge. We have a large range of great trolling and casting lures in stock for the season, including a great colour range of McGrath divers, six blade/vibe stlye lures, New Celtas in rainbow and brown trout, New Metallic Gold Rapalas, Tassies, Lofty's, Sting's, Rebel, Viking, Stumpjumper, Jack's hopper, Flatfish, Strike Pro, TT, Squidgies, Come in and pick our brains on where to use what. Eucumbene:- Eucumbene reports have been varied with wind playing havoc on the weekends. Deep trolling and drifting and casting lures amongst the timber are good methods to use at the moment. Be aware that with the rising water there have been some logs and other debris starting to float and drift around the dam. Keep an eye open for these while travelling around the lake. *Anthony Heiser did well recently trolling up a couple of good browns. Mudeyes will be available for the opening weekend too and should provide some good evening and early morning fishing.